I have finished putting the front end back on. No pics of that yet. I guess that's enough for now. I'll update as I make more progress. Nice looking car sir. Great work on the engine transplant too. Thanks guys. I'm probably gonna pick up a new starter this weekend. I'll try to post a video once it's running good. I didn't realize it when I agreed to it, but I picked up another project this past weekend. Took possession of my little brother's 2001 Eclipse GT. 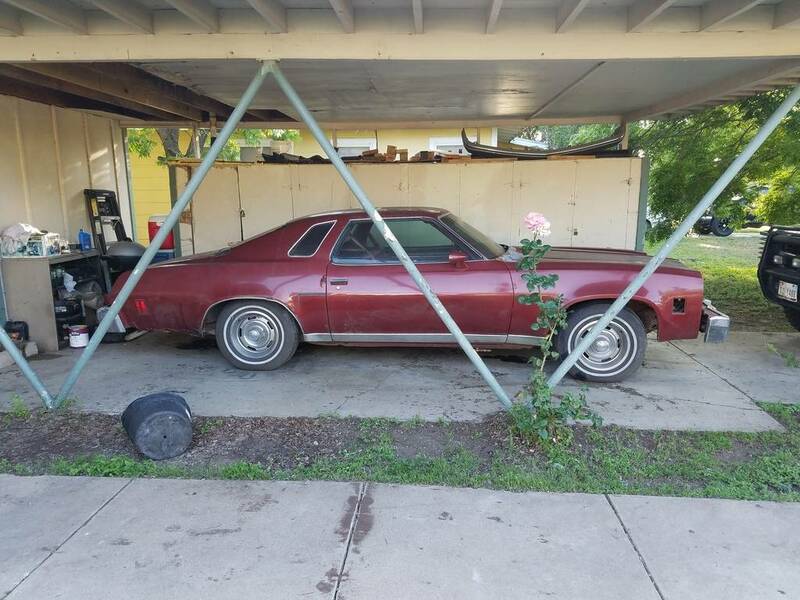 It's not in the shape I was expecting and will need a bit to get it road worthy and dependable. Still trying to figure out which one needs to take the higher priority. 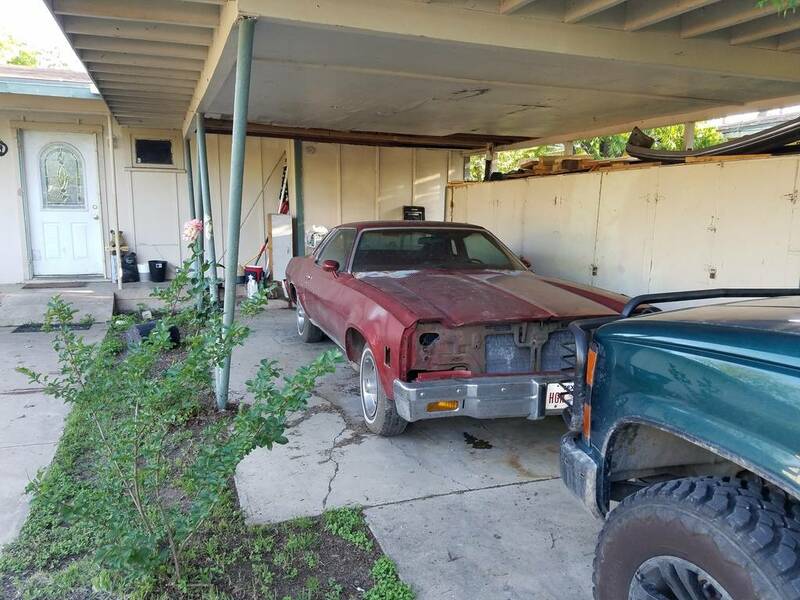 Family heirloom Chevelle vs. Unexpected 01 Mitsubishi. I know which I'd go with. I agree with Roadcaptain. I'd bet the Eclipse will take more money in the long run to make it a reliable car. I know which one I want to go with, but my finance manager (wifey lol) may have a different idea. That is funny, I have the same finance manager for my 73' Chevelle but I am the CEO and she understands it will always be int he family so she doesn't complain too much. Go with the chevelle and forget the Eclipse. Just explain to her working on one car will be cheaper than two. Well I ended up getting a starter. Putting the Mitzi to the side for now. It runs pretty good, but it's boiling the water pretty fast. Only takes about 5 to 10 minutes or so from cold. I still need to adjust the valves. I tried to set the timing, but that's when I noticed the water issue. I checked the thermostat and it opens as it should, and is installed correctly. Feels like the radiator is warm all over, no signs of blockage. It feels like water is flowing through the upper hose. Haven't checked the lower one. Not sure what the heck is going on. Any ideas? Bad radiator? Water pump isn't too old, but I haven't ruled it out. If you water pump is working then the things that come to mind are intake manifold gaskets installed correctly and not blocking the crossover and the head gaskets. If they are not on correctly they will block the coolant path. Also check the timing as it can cause it to overheat too. Tried to set the timing twice, once last night, once today, before it started boiling out. Both times I forgot to unplug the vacuum from the distributor. I don't think it's too high though. I had a thought last night after I put up my last post, I had not yet installed the fan shroud. I just had not cleaned it off yet before I put it back in. I was starting to think that may have been the issue. Nope, but I paid more attention to my fan today, and I think the clutch is bad. It does not seem to be blowing as much air as I remember at idle. I can hold my hand in front of the radiator and then behind the fan near the manifold above the water pump, and there doesn't seem to be much air moving. mikidymac, for the intake gaskets, we made darn sure they were on there right before we put them on. Checked over them at least 3 times while on the head, and on the manifold. Good idea though, but I'm not ready to pull the manifold to check them again just quite yet. I replaced the fan clutch and yea, it was definitely no good, but the water still wanted to boil within a few minutes and the upper hose was collapsing. I pulled the thermostat and ran it without it, no more issues. I guess it was to cold at 160. Now just have to figure out why I can't get it to idle like I want it. I try to adjust the mixture screws on the front of the carb, and they don't seem to do anything. I've added some timing and no change. Added a little more, and no it seems there is a little change, but not quite right. I started off at 8, now I'm at 12. Gonna go 2 more points tomorrow and see if it works. I don't want to add too much though. BTW, the carb is an Edelbrock 1406 on a 350. Cam had advertised 260/260, 204/204 at .050. Any input you guys have would be greatly appreciated. Of course I hope you're going to replace the thermostat sir. As far as being too cold, that's something I myself have never heard of. But I guess you learn something new every day. Yea. Gonna go back with a 180. My Dad tells me to run without it, which really shouldn't hurt anything, but it's in there for a reason, might as well put one back. I say too cold because I'm not sure how else to describe it. It didn't seem to be cycling like it was supposed to. Leaving the water in the engine too long for it to get that hot and building excess pressure which was causing the hose collapse. A higher temp thermostat may solve this. First of all, Nice Car!! Second, I think you should be good with the initial timing @12 deg. assuming that the balancer mark is correct. If you didn't make sure the mark was accurate during the build, it could be off and cause you some tuning issues. Finding TDC can be done in the car, you just need a piston stop and a way to mark the balancer temporarily. I always tune an engine by getting the timing and ignition system sorted first. Then move to the carburetor. The 260 cam should idle and tune like stock. After setting the timing, turn the idle screws down until they bottom, then back out 3 turns. Turn each screw in equally until the engine speed increases. Adjust the idle back down and turn mix screws in equally in small increments as long as the idle keeps going up. Before adjusting the idle screws, or if you bottom out the screws and the engine is still running, look down the carb whille the engine is running to see if there is fuel dripping from the venturi nozzles. This means you have dirt in the needle/seat or the float level is too high. The Edelbrock carburetor is real easy to work on and verifying the float heights would be a good thing to do anyway. One more thing about the timing. The vacuum advance should be on manifold vacuum. People do run without a thermostat but the only problem with that is that once the engine gets hot, it will never have a way of holding the water in the block to pull heat out of it or in the radiator long enough to cool it. Actually a 160 would hold the water in the block for a shorter time before opening to flow into the radiator. If you choose to run without a thermostat the way to do it would be to "GUT" an old one so that there is a restriction in the water flow just like having an open thermostat. Late timing can cause the engine to run hot, but I'm not sure if it would cause it to heat up as quickly as you describe. Thanks for the tips bigredlaguna. Maybe I need to check the floats again. I replaced the floats about 3 months ago, checked them again about a month ago, but I've never claimed to be a carb tech. I'll check it out, but I figured with both mixture screws all the way in, the engine should die, it doesn't, but I was able to hear a noticeable difference in the idle speed as I had added more timing. A friend and engine builder suggested I run at 14 deg initial advance. Seems a little high to me, but maybe that's what it wants. I'll use your procedure to adjust it and see if I can make it idle like it needs too. One thing I forgot to add earlier is, and I did this just to see what happened, when I put it in gear, the idle speed drops as it should, but it seems lower than it should and dies quickly. fasrnur, I think the problem with that thermostat, tested in a pot of water with a kitchen thermometer to verify temp, was that it cycled too fast allowing water to stay in the engine longer, thus getting hotter. It's the only thing that makes sense to me. The overheating and idle drop/stall when put into gear sounds like retarded timing to me. I would definitely verify the balancer marking for TDC because unless the carb is really screwed up, it shouldn't die like that with that much advance on initial timing. If the thermostat opened at the rated temperature, it is fine. How fast it opened/closed is irrelevant. Ok, just read over your posts again. The upper hose should never COLLAPSE. I think you got a reverse rotation water pump. Balancer is fine. Took us 2 times during engine assembly. We were looking at the wrong mark on the timing chain gears the first time and the mark didn't line up when we installed the balancer. Made damn sure it was right when we put it back on. 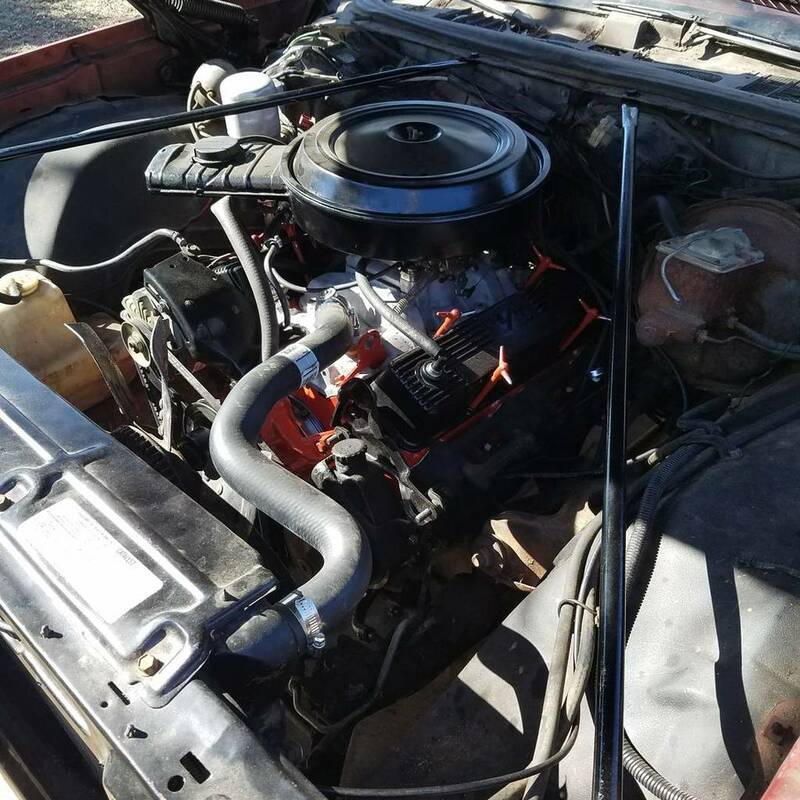 For what you said on the pump, unless there is a difference between the years, the newish pump was purchased about 8 months ago for a 1983 305 pickup with v belts, cross referenced the numbers and it was the same for the 1977 Malibu. 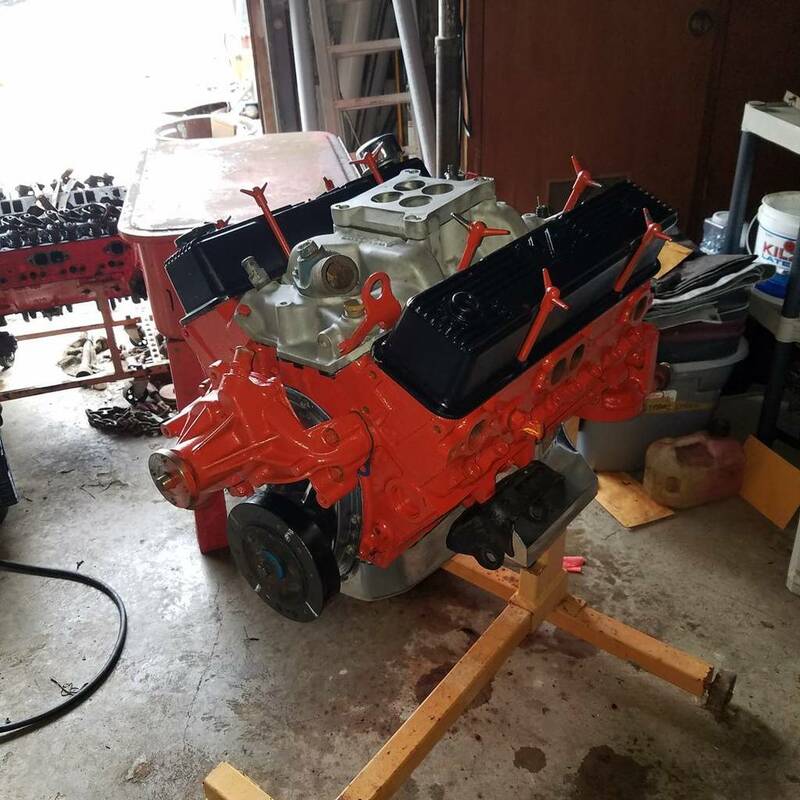 The engine now is from a 1970 Impala. BTW it worked like it was supposed to on the 305 with the spun bearing while I was trying to figure out a carb issue. At that time, it just wouldn't start unless it was primed. Put a rebuild kit in it, also had to replace the floats. The new plunger in the accelerator pump didn't last long. That was the main issue. Put the old one back, worked great. That was 3 weeks ago.